Anti-terrorist operation (ATO) troops, including special task battalions, on Tuesday liberated three towns in Luhansk region – Pervomaisk, Kalynove, and Komyshuvakha, the ATO press center reported with reference to the National Security and Defense Council (NSDC). 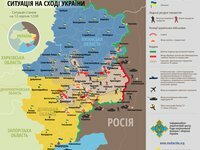 "A group of the Russian special operation forces and about 30 terrorists were destroyed in the liberated towns… The aircraft and artillery of the Armed Forces of Ukraine simultaneously counteracted groups of terrorists who were advancing to strengthen the militants' defenses near the town of Shakhtarsk, Torez, and Snizhne [all three in Donetsk region]. A car with three terrorists in it, packed with weapons and explosives, was destroyed at a road between Horlivka and Yasynuvata [both in Donetsk region]," NSDC spokesman Andriy Lysenko said. A successful operation near Horlivka let the Ukrainian troops make a lodgment and split militants off from the main forces of the self-proclaimed People's Republic of Donetsk. Komyshuvakha, Pervomaisk and Kalynove are located between Popasna and Stakhanov in the west of Luhansk region. In 2011, the population of Pervomaisk was 38,800 people. According to the 2001 census, 2,868 people lived in Komyshuvakha and 3,862 in Kalynove.